Bahamas electronic store selling Laptops, Desktop computers, Flat Screen TV’s, Satellite Systems, Security systems, Surround Sound Systems, Digital cameras, Mp3 players, Video games and consoles, Video game cards. A wide variety of printers and printing paper, wireless routers, external hard drives. Tablets including the Kindle, The Nook, The Coby tablet, The Blackberry Playbook, The IPad 2 and many more. Thee also carry tons of other accessories and electronics. 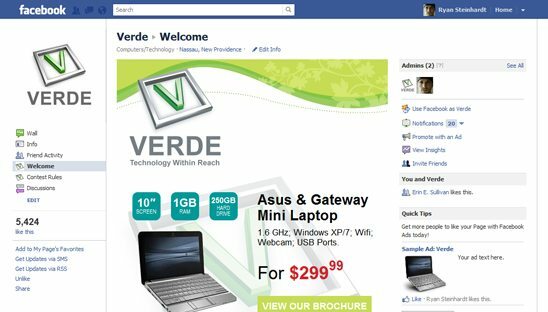 Using their greens and blues, we came up with a clean layout for this custom facebook design. This tab has a fan gate area at the top that showcases a featured product and brochure download once you LIKE their page. Other sections on the page include a facebook photo contest, featured video and multi link area.